Happy Sweet Sixteen, Pretty Parlor! We’re celebrating our sixteenth year with you by offering 16% off the entire store for the Holiday Weekend! Discount includes our Etsy store: House of Pretty Parlor, which is open 24 hours. IT’S TRUE!!! Save an additional 20% off the lowest marked price on sale items now through Sunday (9/3)! Pretty Parlor will be closed on Monday in observance of Labor Day. SALE time! Five Full Racks of Spring & Summer Markdowns. 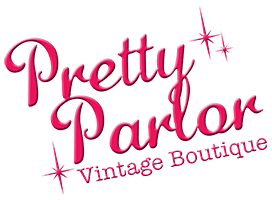 Visit the Pretty Parlor, it’s SALE time! We have FIVE FULL RACKS of spring and summer markdowns of both vintage and new dresses, rompers, swimsuits and MORE! We are excited to extend 20% off to you and yours on this glorious start to summer. We’re fully stocked for summer, let the pool and garden parties commence! PARLOR PEEPS PARTY & TRUNK SHOW! Join us Saturday April 15th, 12:00 – 4:00PM Celebrate Spring Fashion with J. Von Stratton and 15% off the Entire Shop! Join us for afternoon of wedding fashions, macaroons and champagne! Our local designers will be on hand to meet with you and show their latest work.